Medipass Healthcare has successfully secured the replacement of 8 linear accelerators in a deal with equipment manufacturer Elekta on behalf of the Leeds Teaching Hospitals Trust. As the Managed Equipment Services provider, Medipass has been working closely over the last year with equipment manufacturer Elekta and the Radiotherapy service, Trust contractual team, Medical Physics, Engie FM and Albany PLC, to strike a landmark equipment replacement deal for the Leeds Cancer Centre. 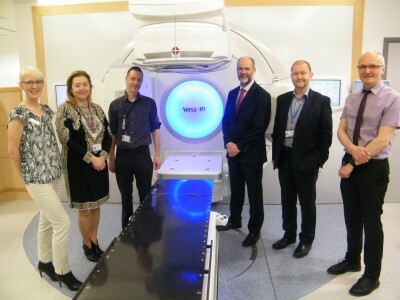 From Left: Hazel Rodger, Head of Radiotherapy for the Leeds Cancer Centre, Aylin Ercil, Technology Specialist for Medipass Healthcare, Chris Forrest, Radiotherapy Equipment Manager for the Leeds Cancer Centre, Paddy Greally, UK & Ireland BU Managing Director with Elekta Limited, Stewart MacDuff, Technical and Commercial Director for Medipass Healthcare, and Dr Viv Cosgrove, Head of Radiotherapy Physics at Leeds Cancer Centre.